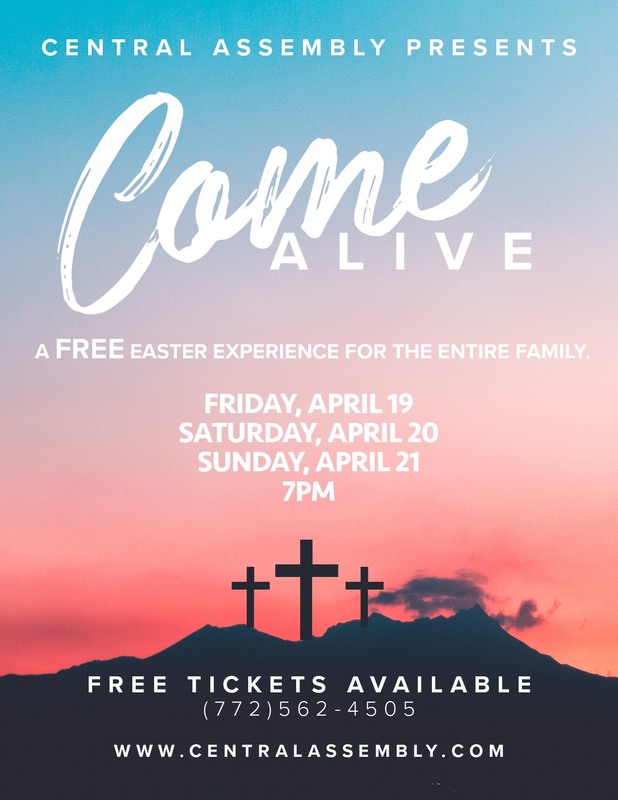 Central Assembly Presents “Come Alive!” This FREE event takes place Friday April 19, Saturday April 20, & Sunday April 21 at 7pm. “Come Alive” takes the audience on a journey through the last few weeks of the life of Jesus Christ. Hear His Teaching, Experience His Miracles, Witness His Death, Burial, & Resurrection from the grave. During a time of fear, hopelessness, and desperation…One Voice, One Man, One Sacrifice changed everything! Central Assembly is excited to partner with Care Net of Indian River County and Voices For Children. Both of these organizations help meet the needs of so many women, children, and families on the Treasure Coast. We are asking you to bring ONE or MORE of the designated items found on the list, at www.CentralAssembly.com, to our performances. Your generous gift is greatly appreciated!